so aptly coined his T206 book (circa 1980)]. An excellent, very informative, and well written book that inspired many of us Net54ers to post our experiences and theory's regarding the complexities of the T206 series. 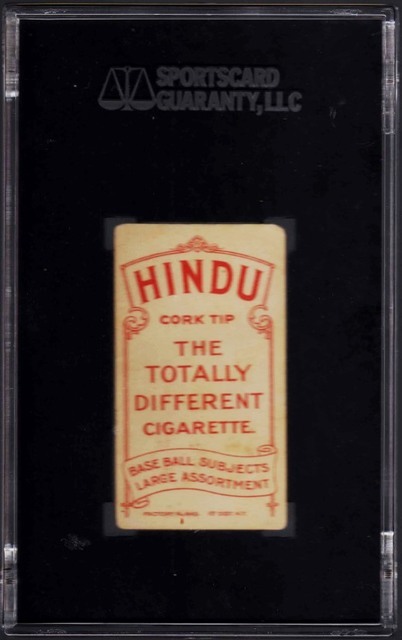 One of the early and very significant T206 threads was posted in June 2006 by Barry Arnold, titled T206 EPDG- - - how rare in your collection ? meaningful posts. Furthermore, between many of us Net54ers, it was "the start of of a beautiful friendship" (to quote Claude Raines to Humphrey Bogart in Casablanca). theory's presented on Net54 (since 2006) have withstood the test of time. Providing accurate lists of which front/back combos were printed. And, which ones are No-Prints. So, stay tuned......many more T206 "oldies but goodies" References and Reflections will be posted here. 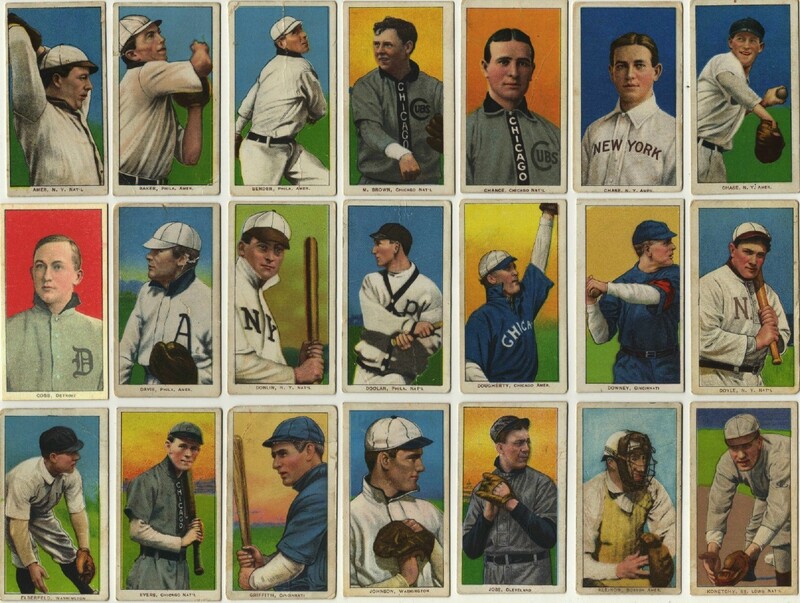 And, feel free to contribute any meaningful T206 stories, or experiences collecting T206's that you have. Post #1......Introduction....plus Scot Reader's " Inside T206 " book, and 3 significant T206 threads (circa..2006) for starters. 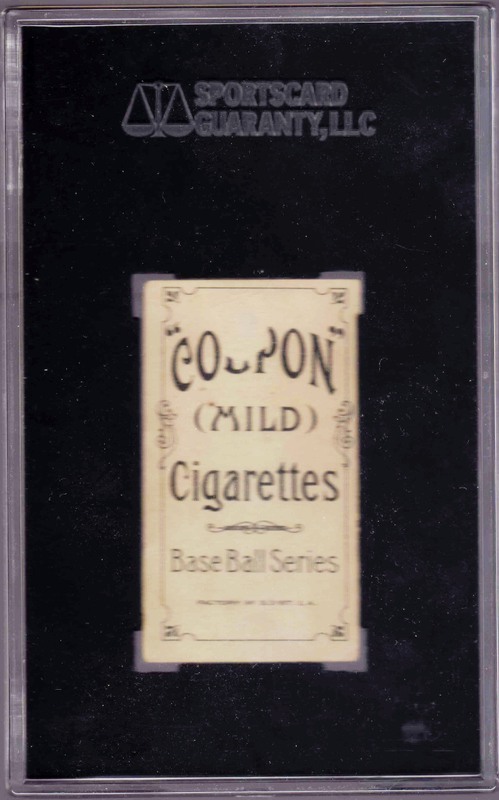 Post #2......The beginning of the six "Super-Prints"
Posts #76 - 77......T206 cards RE-FRONTED (or re-backed)....FAKE's ! 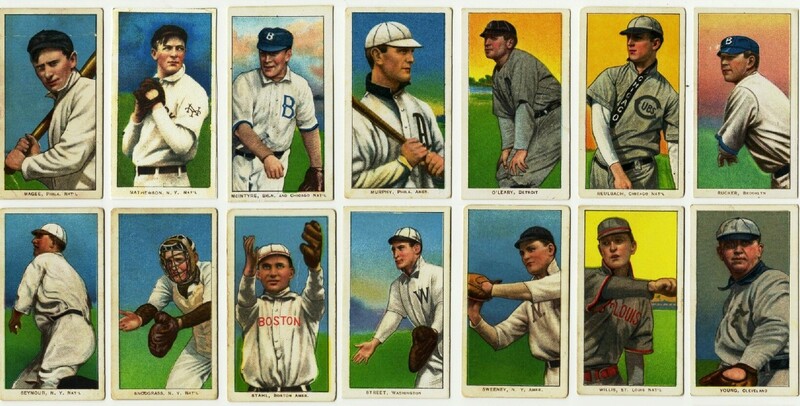 Posts #128 - 131.....Why are Connie Mack, Jack Coombs, Shoeless Joe Jackson, Smoky Joe Wood missing in the T206 set ? 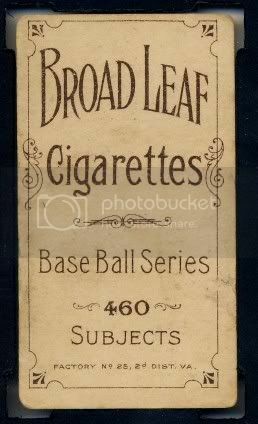 Posts #481 >> 515.....Show-n-Tell us of your T206 "finds"
Posts #537 >> 551.....Guess how many Demmitt & O'Hara St Louis cards exist ? Posts #574 >> 579.....T206 "Monster" obsession ? ....Check-out this one ! Posts #580 >> 597.....Do the T215-1 cards belong in the T206 set ? 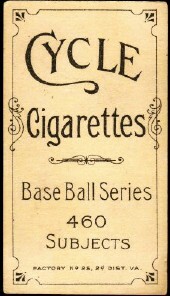 Posts #598 >> 600.....Any guesses why no CHESTERFIELD or LUCKY STRIKE T-cards ? 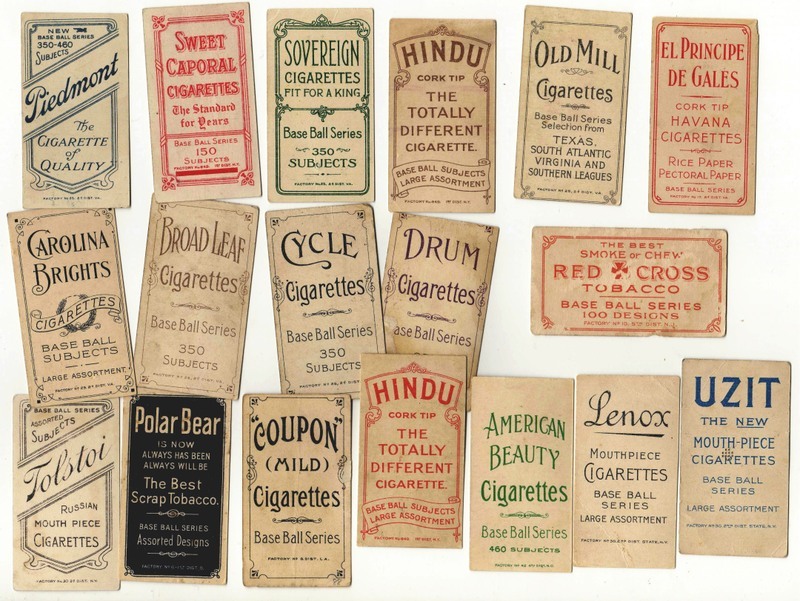 Posts #601 >> 603.....Any guesses why no CHESTERFIELD or LUCKY STRIKE T-cards ? 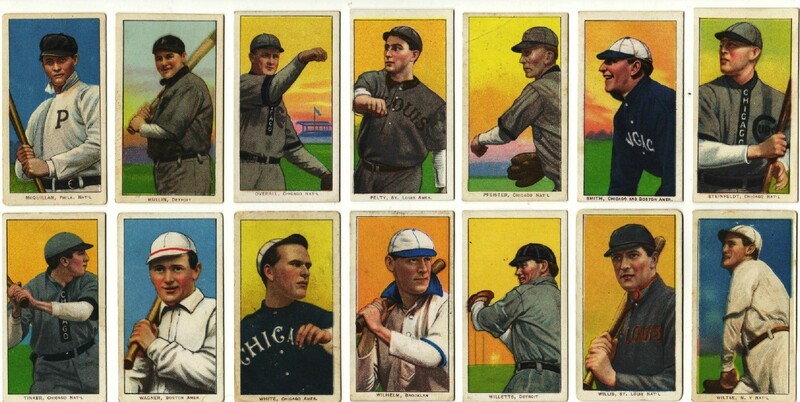 In this thread, I've tried to present some very complex aspects of the Series structure of the T206 set in a style which is understandable to most of the T206 collectors. In either event, I will gladly do my best to provide you clear and meaningful answer(s). Last edited by tedzan; 04-22-2019 at 06:34 PM. Reason: Updated INDEX. Not Printed with Sovereign backs. to say that my list of No-Prints have withstood the test of time. 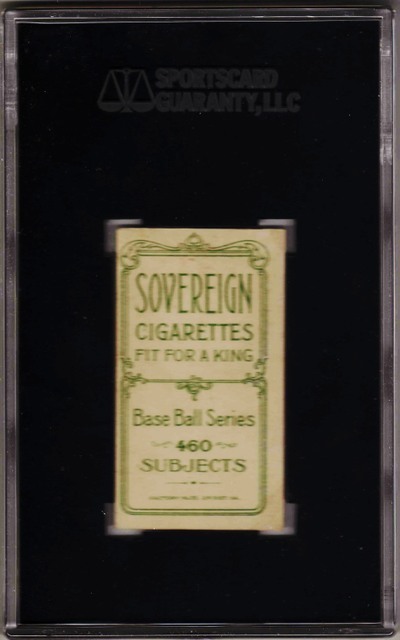 During the Sovereign press runs, American Litho (ALC) introduced a new feature into the T206's....the 350/460 series. ALC selected from the 350-only series 6 subjects **. And, printed them with Sovereign 460 backs during the printing of the 460-only series (46 subjects). Note that the Sovereign 460 versions of these 6 subjects are considerably tougher to find relative to the regular 46 subjects in the 460-only series. 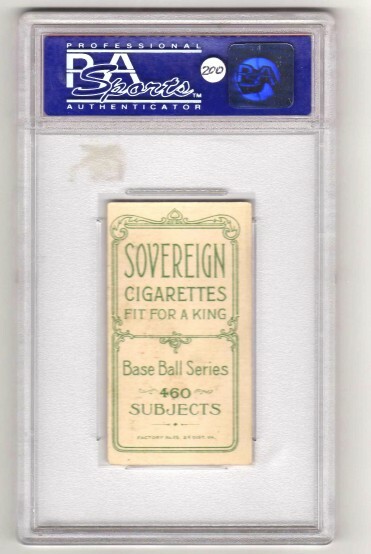 The 350/460 story continues in the following post with a complete array display of the 66 subjects (with Sovereign 350 backs) which ALC designated for the 350/460 series. 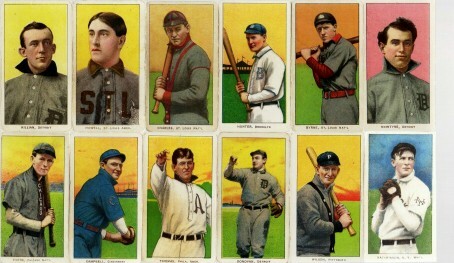 the T206 set. In his book titled "Inside T206", Scot identifies these 6 guys as the " Super-Prints ". Last edited by tedzan; 06-28-2017 at 10:06 PM. Reason: Update scans. Nicely done, Ted. Thanks for sharing!! 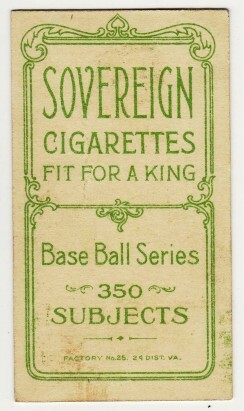 the backs of these 66 cards using an apple green colored ink (instead of the deep green seen on the backs of all the other SOVEREIGN cards). The next two posts will get more into the "nitty-gritty" of this mystifying 350/460 series......especially regarding their front/back combos. I show the super-prints Double-Printed (D-P) on this sheet, since several large T206 surveys have indicated that the 6 super-prints were D-P.
Last edited by tedzan; 08-19-2017 at 04:35 PM. Reason: Correct typo. Stay tuned for the "rhyme-n-reason" of the mutually-exclusive front/back combos found with the 460-type backs in this 350/460 series. Last edited by tedzan; 03-11-2018 at 07:02 PM. Reason: Correct typo. Thanks, I really appreciate your compliments, Leon. Very cool Ted...It's awesome to see so many of your t's in a bunch! This is the best I can do for now...a few odd remaining t's! with the rare AMERICAN BEAUTY 460, BROAD LEAF 460, Red HINDU, and UZIT backs. were printed as pairs. Furthermore, these two sets of pairs are mutually exclusive. Refer to.... 350/460 mutually-exclusive cards ....post #14. 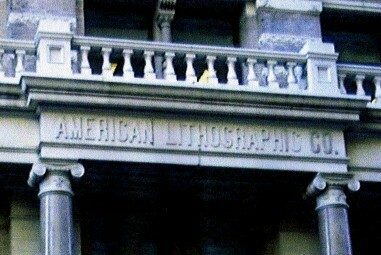 American Lithographic separating these 63 subjects into two print groups. 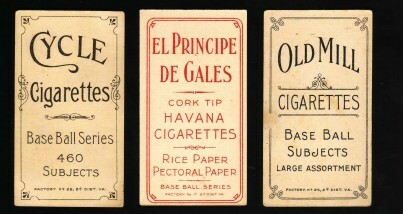 Group A of the 350/460 series includes 35 subjects printed and issued with these four 460-type backs (circa..late 1910 > early 1911). Factory #25 VA ......................... Factory#42 N.C.
Group B of the 350/460 series includes 28 subjects printed and issued with these two 460-type backs (circa..Feb-Mar 1911). Stay tuned for the next Reference or Reflections. New topic....I'll surprise you ? Last edited by tedzan; 04-13-2019 at 07:35 AM. Reason: Corrected typo. Thanks for the "awesome"....it's one of my favorite adjectives. 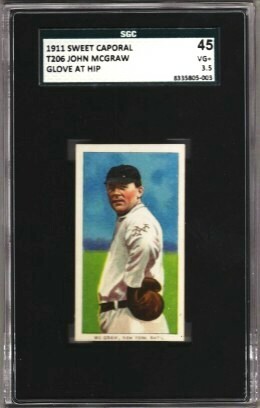 Judging from your scan, we both collect similar pieces of colorful cardboard (besides BB cards). Take care......hope to see you at the National this summer. Good stuff Ted. Here's a snippet from one of my favorite T206 discovery threads. It was a 2008 thread--started by you--where what I call the "southern league paradox" was resolved collectively by the Net54 research community. Jamie Hull was a major contributor. I'll link a few more of my favorite T206 discovery threads later. Last edited by sreader3; 04-08-2017 at 07:13 PM. Here is another gem where the 350/460 back profile was fleshed-out. I think this thread is groundbreaking in describing the back profile for each and every subject in the 350/460 RP group, the superprint group and the 460-only group. That thread was very informative. Thanks for referencing it. 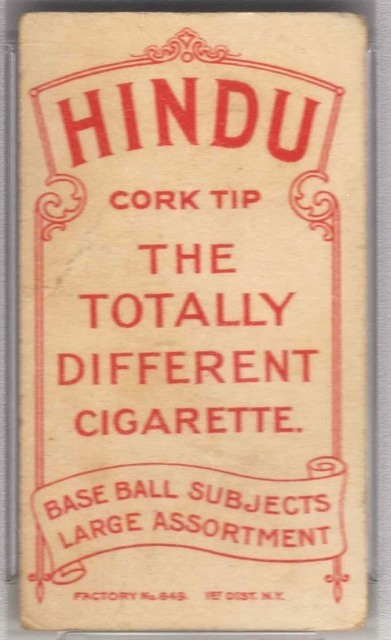 And, I do miss Jamie Hull, he would chime in with some very meaningful info regarding T206's. Also have to cite the Net54 "Elite" surveys you spearheaded in 2007-2008 confirming that certain 150/350 guys were only available in the 350 series with the Piedmont 350 back. Those were classic. 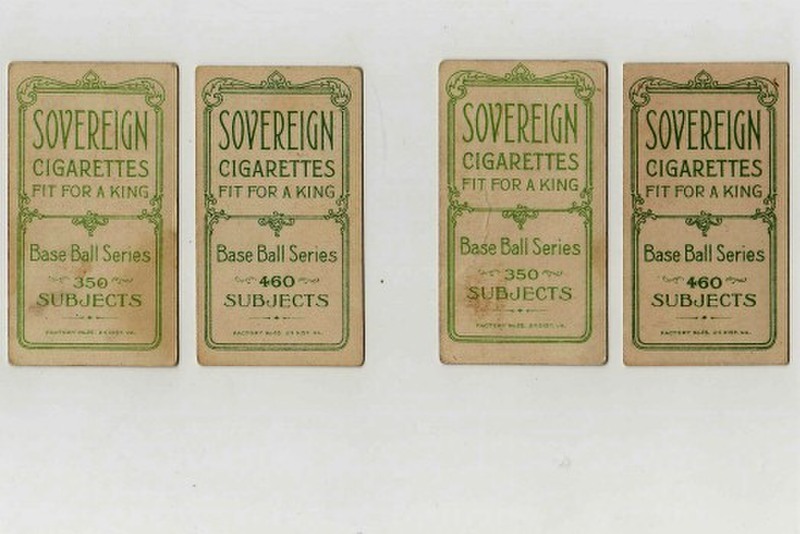 ** Note.. Scot Reader's excellent research revealed that these 6 subjects were printed in larger quantities, and with more Tobacco brands than any of the other subjects in the T206 set. In his book titled "Inside T206", Scot identifies these 6 guys as the " Super-Prints ". Lastly, Ted, thanks for this acknowledgement. The existence of the six "superprints" was probably the most interesting of the discoveries revealed in my first (2006) version of Inside T206. Last edited by sreader3; 04-09-2017 at 01:25 PM. sets. 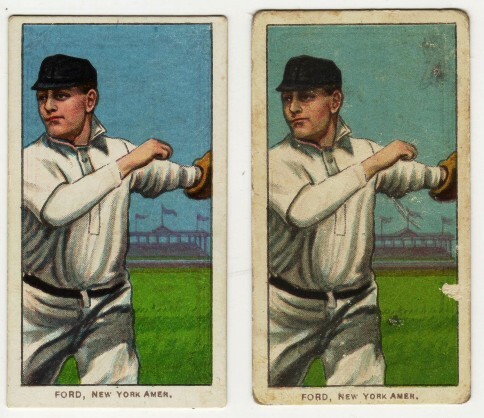 There were variations and certain printing anomalies regarding cards in these sets that were not well understood in the hobby back then....and, I clarified them. 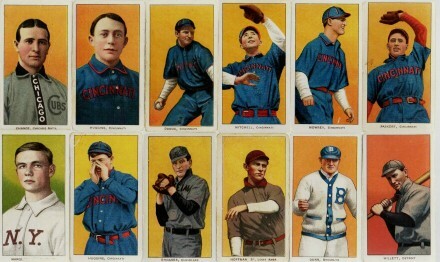 could talk about the various aspects of sports cards for hours. would then call me at home and tell me in no uncertain terms that I was wrong. And, there was no way that I could converse with him in a meaningful manner. the auction that sold the "Gretzky Wagner"). Confused...i post #2 you say "ALC selected from the 350-only series 6 subjects.."
then in post #4 you state there are "66" subjects in 350/460 series...then further on in post #8 you mention "63" subjects. maybe i am misreading subtle differences in each context? Good stuff, thanks for compiling in one thread. The array of 66 subjects (in post #4) includes Joe Doyle, Simon Nicholls, and Bob Rhoades (who initially were intended to be continued into the 350/460 series). 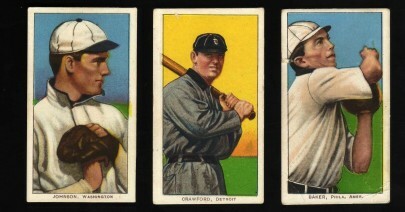 However, the Major League careers of these 3 guys ended prior to American Litho printing the 460-type backs. Thus, the 350/460 series consists of 63 subjects. In post #2......I introduce the 6 super-prints....then in post #4, I illustrate the 66 subjects that were intially selected to be included in the 350/460 series. 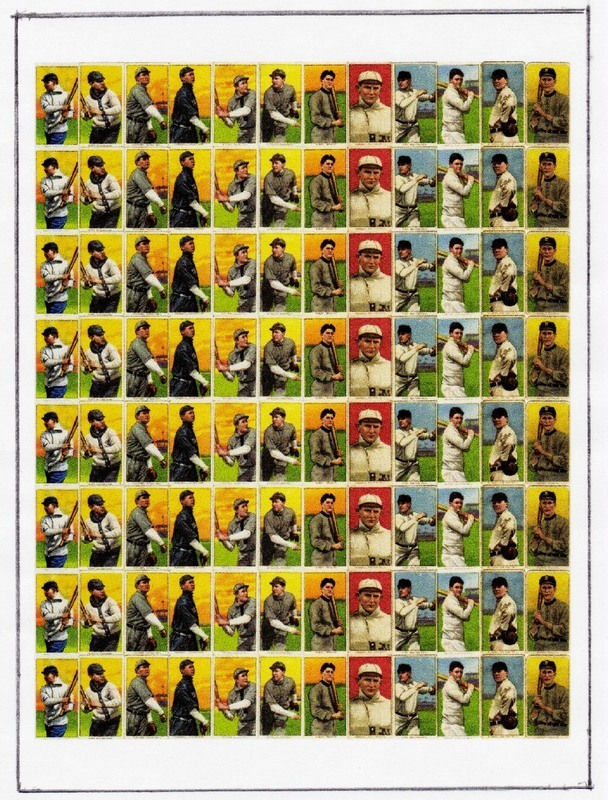 These 66 guys are composed of the 6 super-prints and 60 additional subjects. Great story. Joe was a character. We had some good laughs on the phone before he passed. He was super friendly one-on-one. And, he had the ONLY copy of Schulte (Front View) Piedmont 350 in existence! (As you know he also had the Doyle Error). For years, Joe kept insisting on our calls that he had a copy of the then unconfirmed Schulte (Front View) with Piedmont 350 but could not figure out how to send me a scan! I believed he had the card, but was blown-away that he didn't have a scanner (or at least couldn't figure out how to use it). He was old school -- which is actually endearing considering we are talking about old baseball cards that are cherished across generations. Last edited by sreader3; 04-10-2017 at 07:02 PM. It was a popular thread with 113 responses; and, it is somewhat intricate. But I think you'll find it quite interesting. complete my all--Sweet Cap, Factory #30 set. 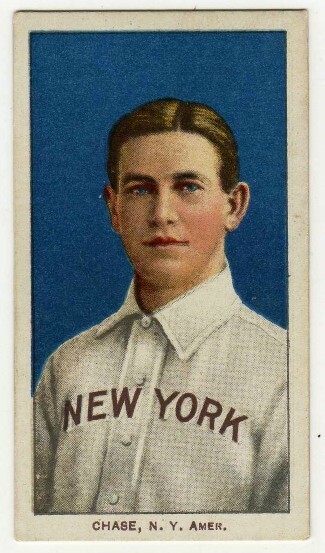 The majority of the Plank cards have Sweet Cap 350 backs. he didn't "hype" it up like Wagner did. Let's hear your thoughts on this subject ? I simply told him it was either a "scrap", or an anomaly. Also, I noted that if an EPDG card of Schulte were to appear, then I would be convinced that it was a legitimate issue. Well, we have yet to see an EPDG card. It's hard to say whether the card is scrap. Looking at the card it is difficult to tell. And there are other unique front/back combos in T206. Heck, there are only two or three confirmed copies of Spencer with Piedmont 350 (although I recognize he exists with EPDG). I remain agnostic on Schulte 350's "scrapness." Last edited by sreader3; 04-10-2017 at 09:36 PM. 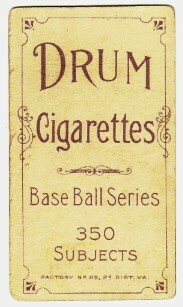 In 2008, a thread regarding an interesting 350-only series design that I refer to as the "A-B-C-D connection"...... T206 DRUM's....and their "A-B-C-D connection"
will continue to be discovered in the future. Here's my Frank Delehanty A-B-C-D connection......these are tough sub-sets to complete......so, let's see yours ? Stay tuned....the next post here will expand on this sub-set. Last edited by tedzan; 06-28-2017 at 11:33 PM. Reason: Correct typo. 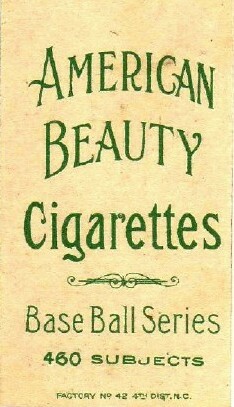 identical to the stylized design of the A-B-C-D cards. 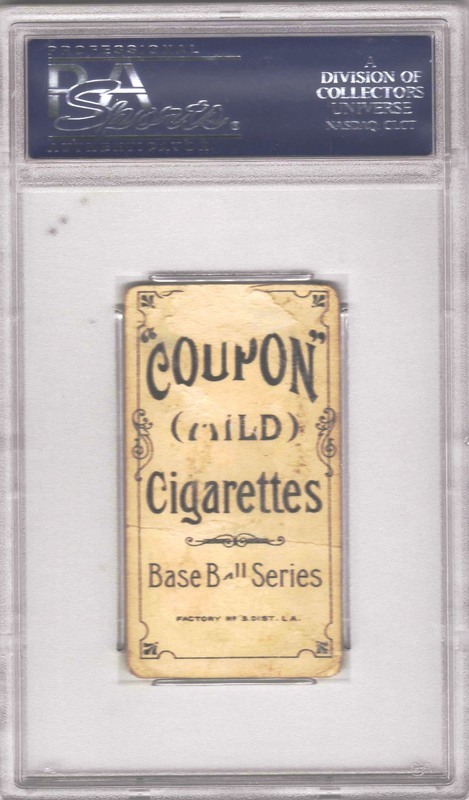 Providing us proof that the timeline of 1910 COUPON (T213-1) set was issued Spring / Summer of 1910. The blue Chase is my favorite T206 subject. If a DRUM card of Mr. Chase ever shows up, I might have a chance to complete this A - B - C - C - D sub-set. Last edited by tedzan; 11-23-2018 at 08:08 PM. Reason: Corrected typo. The new members of the board need to read this thread from 12 years ago to get an insight of how this monster we call the T206 came about. Bill adds two posts one below and one that he receives packages with 2000 T206's at a time. Truly a hobby legend. This is Bill Heitman. Most, if not all, of the errors referred to were caught within about a year of publication of The Monster. They were all errors made by the publisher that I didn't catch in proofing the book. He also added the Farrah pictures without my knowledge. But, Denny was a great friend, and I let that slide. My original working checklist does not have these "errors". I notified everyone via articles in Trader Speaks of the publishing errors. 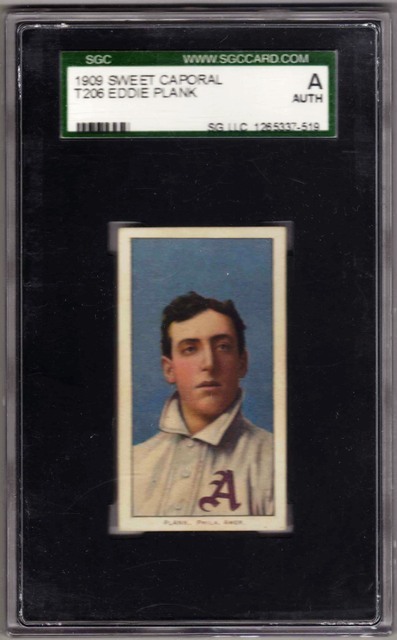 Incidently, I have probably had in excess of 1,000,000 T206s in my possession. My collection was able to fill about 4800 spots on my working checklist. Also--thanks for the compliments. Last edited by 2dueces; 04-14-2017 at 07:55 AM. 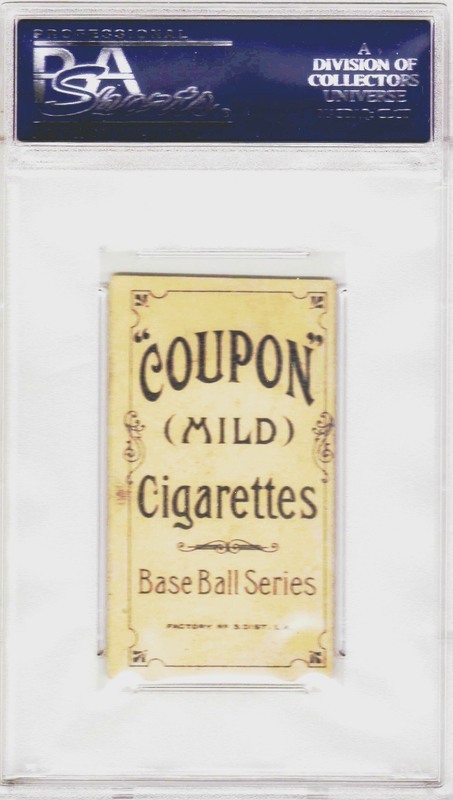 There has been much controversy on this forum as to whether the 1910 COUPON (T213-1) cards belong to the T206 "family". And, much of this is due to mis-information. 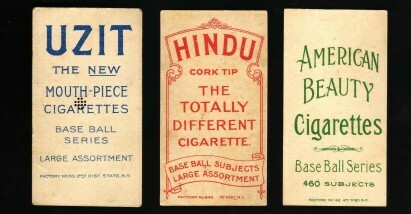 T213-2 and T213-3 cards (with blue captions), the 1910 COUPON cards' captions were printed with Brown ink. 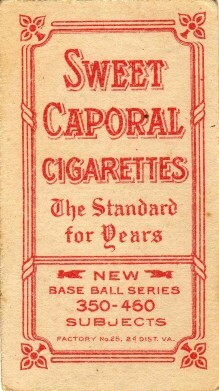 1910 Coupon cards were placed inside these cartons, or "spot-glued" on the outside of the carton (indicative of the red Cobb's paper loss on its back, as shown below). issued 1914 - 1915 (his stated timeline). It's my opinion that Burdick would have included the T213-1 in his classification of the T206's, had he known what we now know. 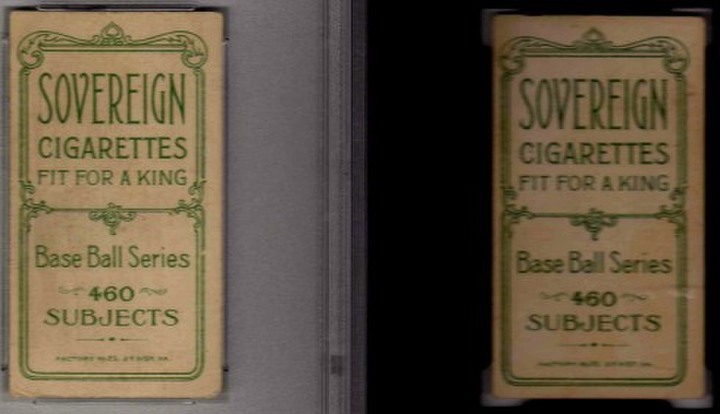 Furthermore, we now know that the T213-2 and T213-3 cards were actually issued 1914 - 1919. 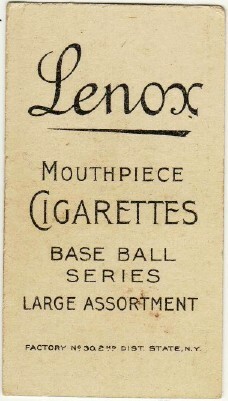 The Six Super Prints are seldom seen with the 1910 COUPON advertisement. Last edited by tedzan; 12-23-2018 at 05:23 PM. Reason: Correct typo. for only $15 - $20, each. Furthermore, if you were lucky to find a dealer at the Show selling a DRUM....you could get it for a mere $100. Dennis Eckes was the publisher of Jim Beckett's BB Card Price Guide (1st edition, 1979). 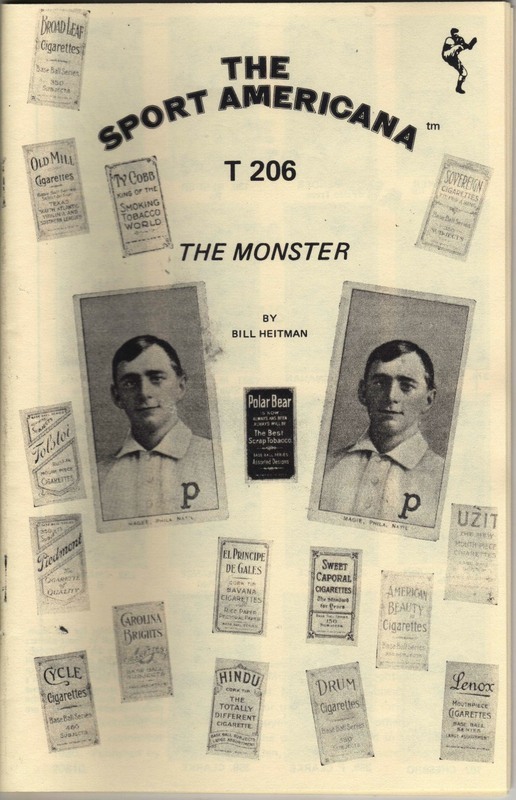 Dennis published Bill Heitman's 32-page book "T206 The Monster" in 1980. Dennis was fascinated with Farrah Fawcett. So what guy wasn't when she appeared on the scene in the late 1970's. 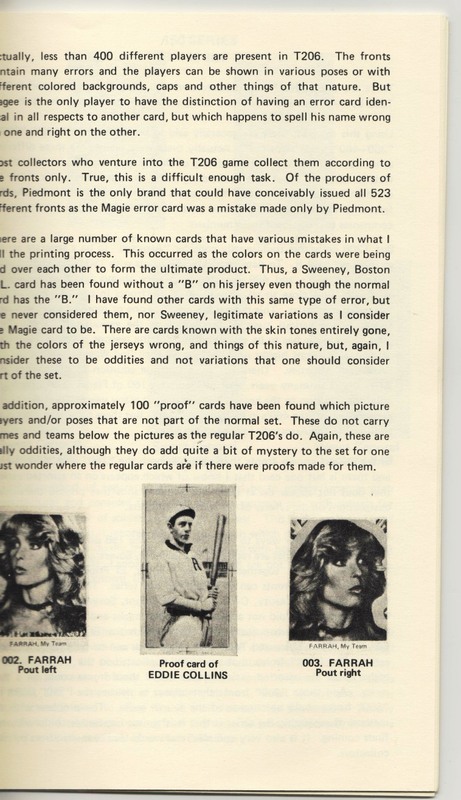 Dennis included 6 poses of Farrah in Bill's book. 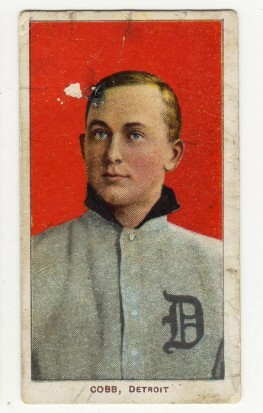 Jim never waivered in his belief that this Ty Cobb card should have been classified as a T206. Last edited by tedzan; 10-13-2017 at 03:49 PM. Reason: Correct typo. This project has been a work in progress on Net54 since 2005. Additional inputs (or corrections) to these checklists are greatly appreciated. In Jan 2011, for ease of access, I consolidated into a single thread the T206 front/back surveys which were previously conducted on Net54. 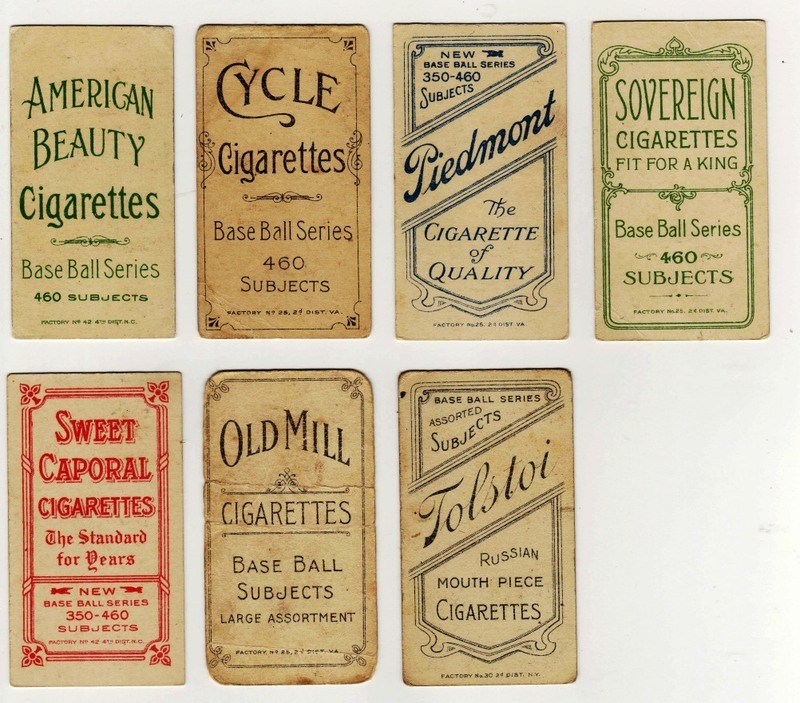 they are White-Bordered, Brown-Captioned Tobacco cards printed and issued by American Lithographic within the 1909 - 1911 timeline. 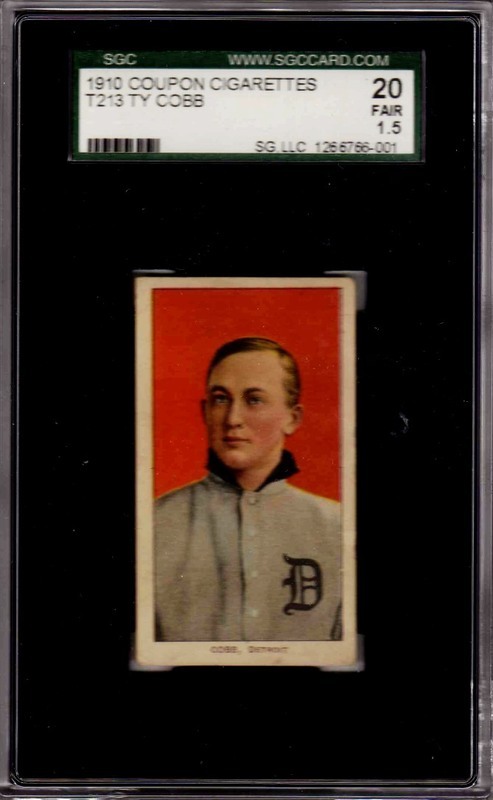 And included is the Ty Cobb card with TY COBB back (issued Spring/Summer 1910), since it also conforms to the above stated T206 rubric. T206 confirmed front/back surveys with respect to T-brand. Last edited by tedzan; 06-28-2017 at 11:35 PM. Thanks to Ted and all the others who contribute to these general knowledge threads. They are a very valuable resource, especially for new collectors. 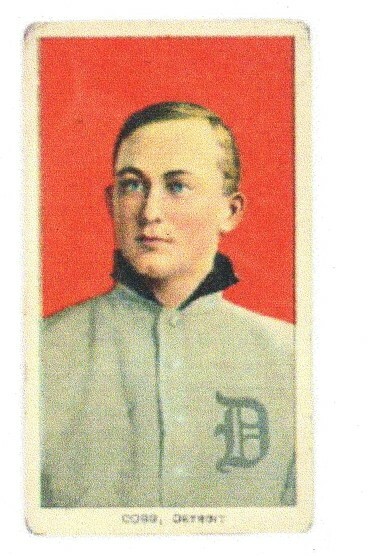 Imagine pulling a Joe Doyle Nat'l card from a Piedmont pack when you were a teenager. 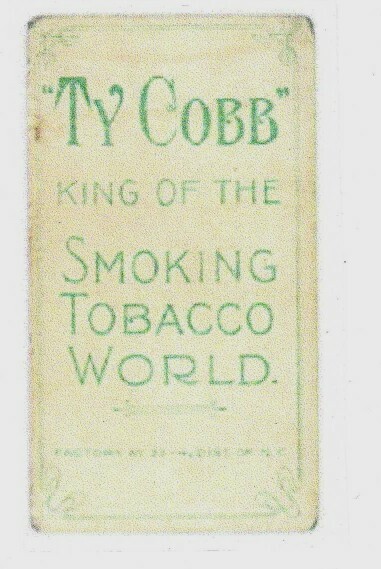 Or, your Dad's visit to Atlanta in 1910 acquiring a Ty Cobb/TY COBB card for you ? ? 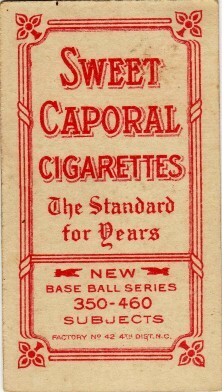 tobacco cards were donated to Georgia U. in 1983 (along with Russell's historical papers). different cards. 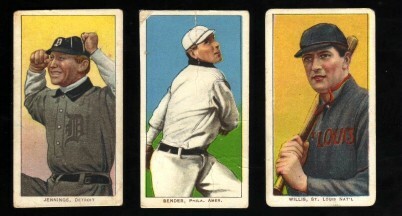 As depicted in the header illustration above, no Wagner or Plank in his collection. Not unusual, since these two gems were not marketed with Piedmont backs. 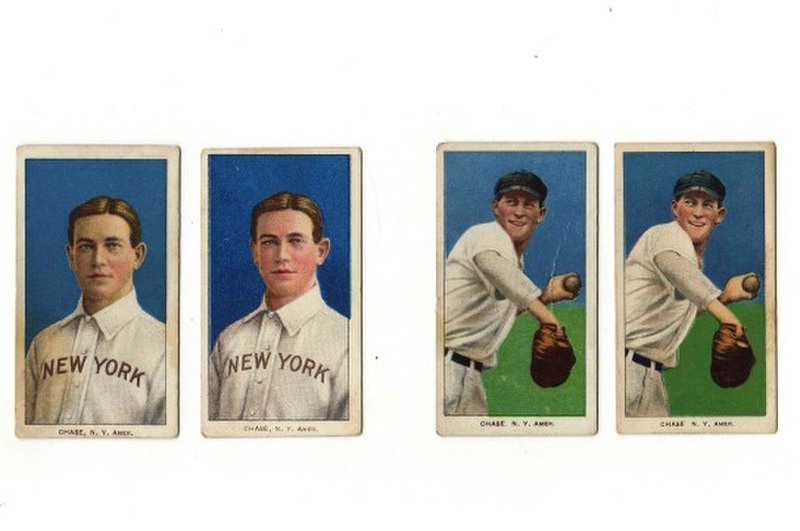 Also missing in his set (as shown) are Lajoie, Marquard, Chance, and the Magie error. 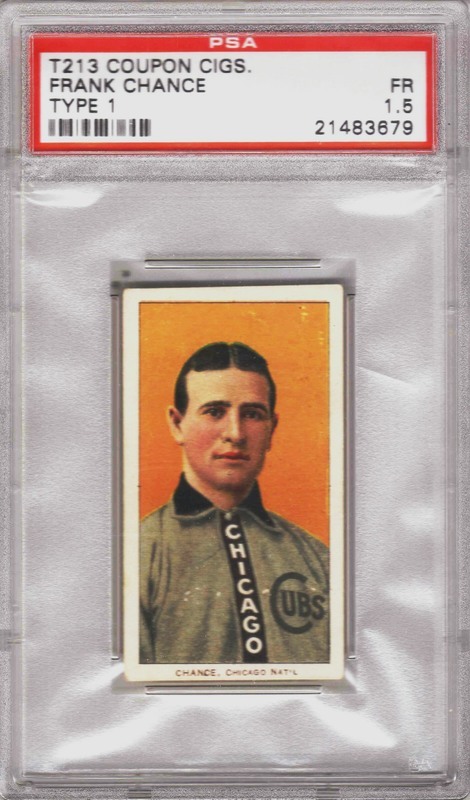 also ended at that point (judging from the fewer number of T205 cards in his collection). a desk drawer from Russell's estate. 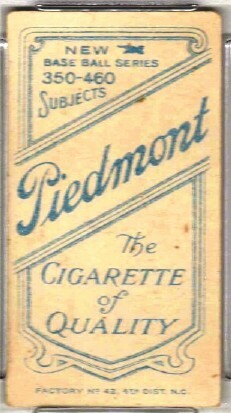 The T206's were all Piedmont 350 backs. Including 7 of them from the "Elite 11" group. I was thrilled to acquire all 7 of these rare cards. Furthermore, I called the dealer in Atlanta and he was a wealth of information regarding the Russell collection. Last edited by tedzan; 04-24-2017 at 03:26 PM. Reason: Correct typo. WOW ! I am happy to see someone out in the hinterland is interested in this good stuff. 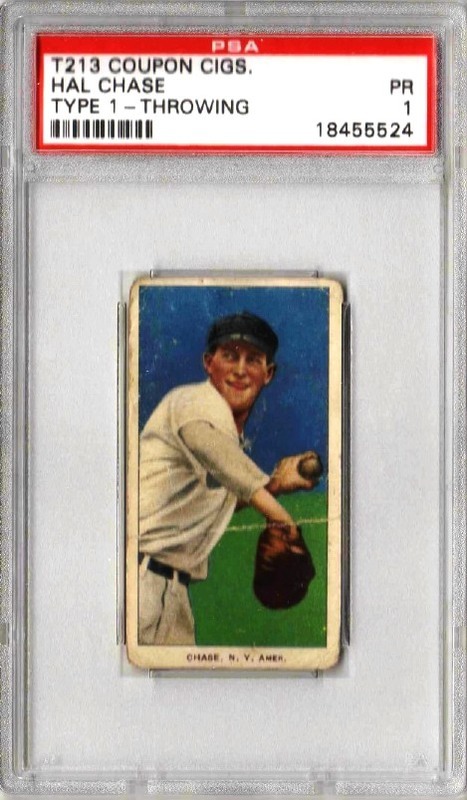 I received an email from a Net54 reader who is fascinated with the Russell collection. One of the questions he asked me...... "Which additional cards are missing from Russell's set ?" 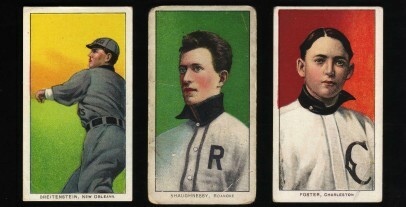 Plank and Wagner (The PIEDMONT 150 cards of these two subjects were printed by American Lithographic, but never issued in cigarette packs). Demmitt and O'Hara (St Louis variations) were printed only with POLAR BEAR backs. 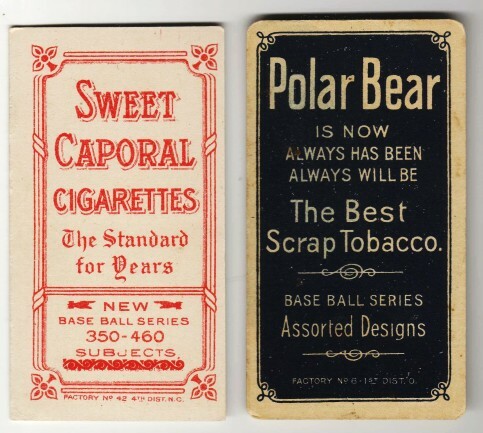 POLAR BEAR cigarettes were not marketed in Georgia (circa 1910-1911). 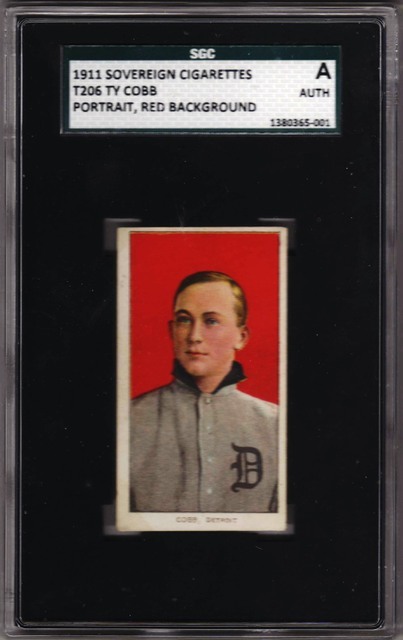 Furthermore, Russell's T206 set approaches a master all-PIEDMONT set, since it includes most of the additional PIEDMONT 350 cards of the 150/350 series subjects. If anyone has anymore questions regarding this set....or questions about Mr. Russell....don't be shy about asking them. I will try to answer them. Illustrated here is my concept of an Exclusive 12 printed sheet....based on American Litho's 19" wide press, and a standard size 19" x 24" cardboard sheet. More specific info and T-brand back runs regarding the Exclusive 12 group will follow in the next post. Last edited by tedzan; 04-28-2017 at 01:40 PM. Reason: Correct typo. 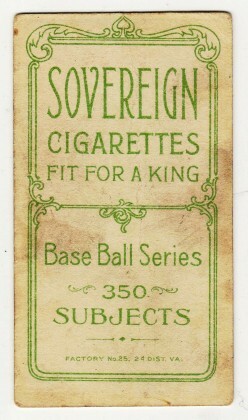 Exactly 13 - T206 backs were printed on each of the Exclusive 12 subjects in the 460-only series. 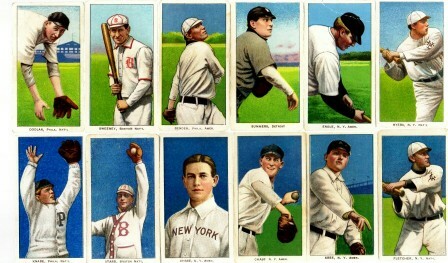 Illustrated here is the complete run of the McGraw cards. cards printed in this group. Incidentally, this McGraw (glove) with UZIT is a brand new find. Last edited by tedzan; 04-18-2019 at 08:39 PM. Reason: Corrected typo. Go for it Ted!! Your almost there. I'm only at 41 without trying and no Piedmont or Sweet Caporal's. I'm gonna have to put a little more effort into these. Thank you for all your T206 research. Last edited by Ronnie73; 04-29-2017 at 01:41 AM. I really appreciate your words of encouragement......Thank you. Last edited by tedzan; 02-10-2018 at 08:21 AM. test of time as new DRUM cards have been discovered these past 7 years. The one exception to this rule is Mullin (bat), who has not yet been confirmed with a DRUM back. Posted in 2015, the following theory regarding the AMERICAN BEAUTY 350 (NF) series of 37 subjects is based on my long term experience tracking down these AB 350 cards. 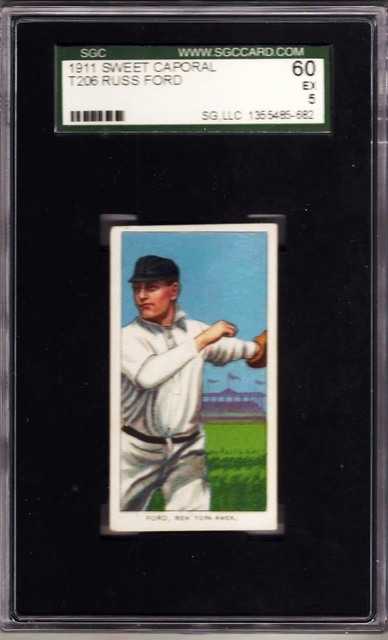 Nicholls AB 350NF POP report (SGC + PSA) is 7 cards. 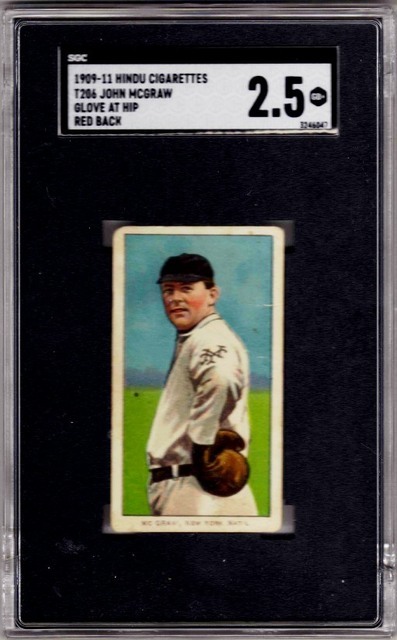 Stahl AB 350NF POP report (SGC + PSA) is 8 cards. The POP report (SGC + PSA) of any of the remaining 35 subjects in this group averages 14 cards each. Mullin (with bat) has yet to be confirmed with DRUM. I feel certain this card will eventually be discovered. is representative of the relative availability of certain cards with respect to other cards within that group. Last edited by tedzan; 06-29-2017 at 09:10 AM. Reason: Correct typo. Not trying to shoot your idea down. I just recently wrote an article about this subset and looked at the Pops for all 37 cards, so I remembered that neither of these cards were in the single digits. I just reviewed my records of 2 years ago and the Pop numbers I had posted in my thread did not include the PSA data (although I stated that in that thread).....my bad. Nicholls and Stahl, I say they do support my contention. So. what say you about this ? PSA has 2 distinct AB 350NF listings for Nichols. The listing you didn't cite has only 3 graded. Please explain why you chose the 9 data ? And, what is the difference ? PSA used the generic "American Beauty" for all ABs regardless of series when they first started noting the backs on the flip. Recently, they got more specific and now they will note "American Beauty 350 no frame" on the flip. The generic "American Beauty" heading below shows how many total Nichols American Beautys have been graded (9) and the more specific heading below that shows how many have been graded more recently and given the more specific "American Beauty 350 no frame" flip. 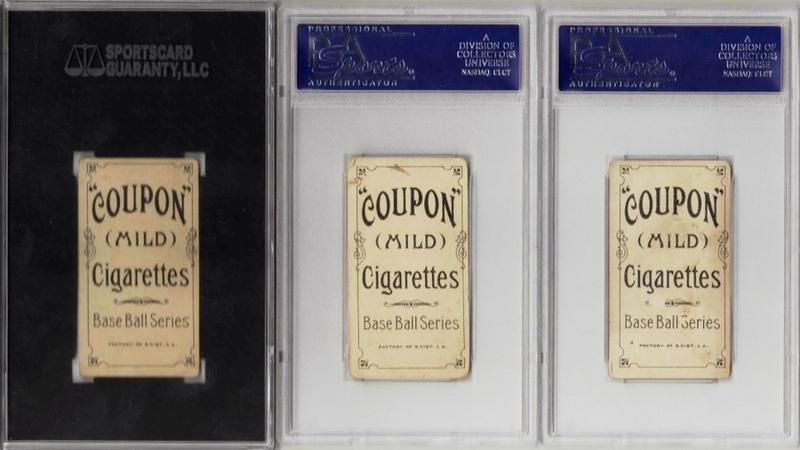 If you look at the individual entries in the "AB 350 no frame" listing, you'll see that those 3 cards are also counted as part of the 9 total cards graded under the generic heading. Since we know that all Nichols ABs are the AB 350nf, we know that all 9 have the same back. It's the same for Sovereign and Cycle. 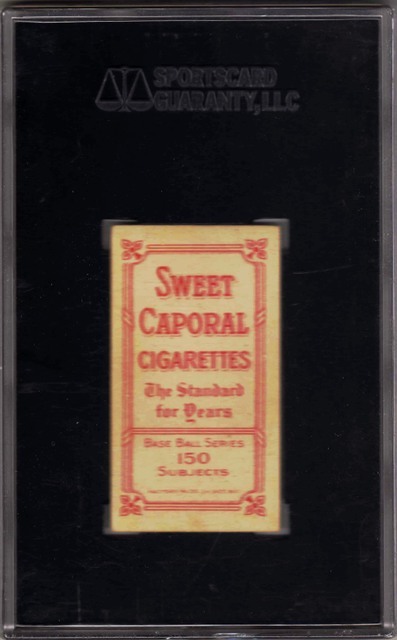 The Pop reports are not of much value for finding how many Sov150 have been graded if the same pose exists with Sov350. The generic heading will have say 30 listings, and the specific Sov150 and Sov350 listings might only have 2 or 3 each. Here is my copy. You can see that it is listed in both the generic and the specific headings. Last edited by Luke; 05-01-2017 at 03:45 PM. Thanks for clarifying the two PSA listings on the same Nichols card. 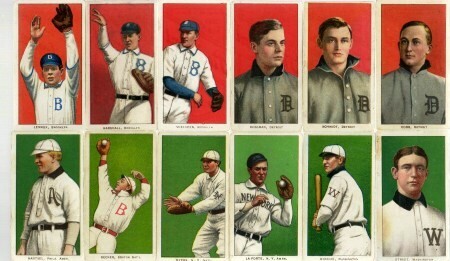 I will begin with my 1st set of T206 cards. 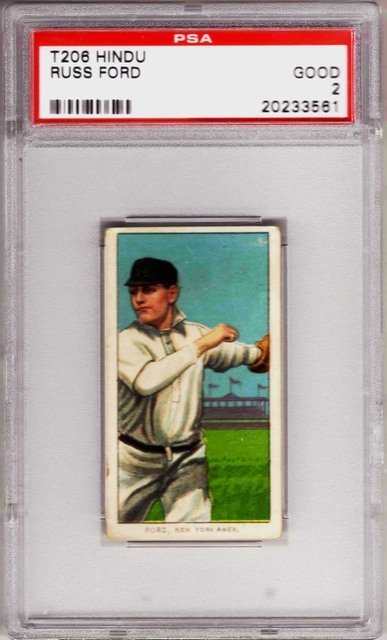 I started collecting T206's in 1981, when I acquired the Hal Chase card (displayed here) at the Willow Grove Show in Pennsylvania. 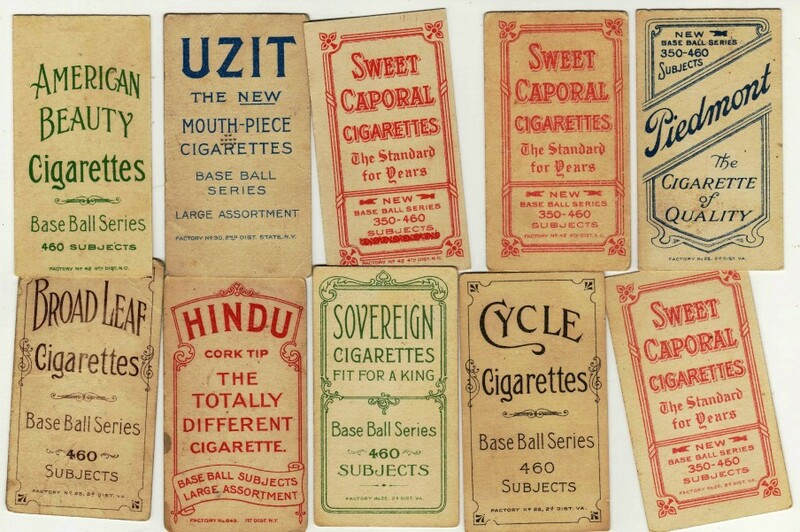 I've always been an avid set collector (completed sets of 1887 A & G, 1888 N162, T205, T207, Goudey's, Dia Stars, PlayBall's, Leaf's, Bowman's and 1952 Topps-1987 Topps. So, this T206 set was not high priority for me. I completed this 521-card set circa 1996. I was smart about buying the Cobb's (and other major stars) in the early 1980's. The Cobb's were selling for only $20 back then for VgEx to Ex condition. Also, I acquired a MAGIE (Vg) for only $600 (circa 1987). Furthermore, note the Lundgren / EPDG at the top of this page. I thank Barry Sloate for starting me searching for rare front/back combos with this one in the early 1980's. Anyone want to guess what I paid for this card in 1981 ? 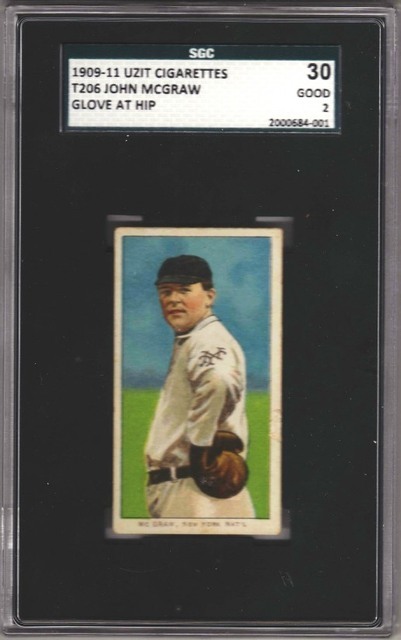 OK guys, that's my initial T206 story......would love to hear your experiences in the quest to (near) complete "The Monster" ? 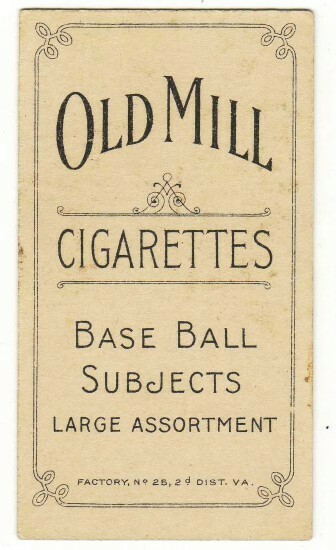 I'm guessing you paid $6.That include a premium for the rare Old Mill back. I paid $8 for the Chase. 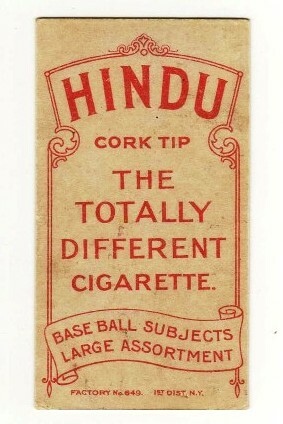 Back then, unless it was a T206 DRUM back, not much consideration was given to "rare" backs by most dealers. 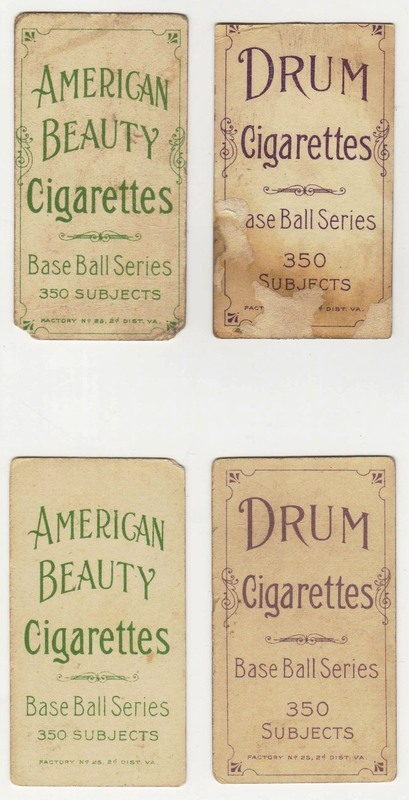 Gee, I thought some of you would chime in here and share your experience(s) of putting together your T206 sets. relatives. And, he was bringing his T206 collection with him. He asked me if I was interested in it ? Of course, I said yes ! dinner at the near-by Washington Crossing Inn. I acquired the needed Stars and Commons to make it a 520-card set. Stay tuned, my 3rd set is an interesting adventure. Meanwhile, I do look forward to hearing of your set experiences. Last edited by tedzan; 05-09-2017 at 09:08 PM. Reason: Correct typo. I got somewhat of a late start on my T206 collection. I didn't get serious about the cards and the set until 2010. Before that, I spent time collecting post-war cards, coins, stamps, and comic books from 1982 to 2009. 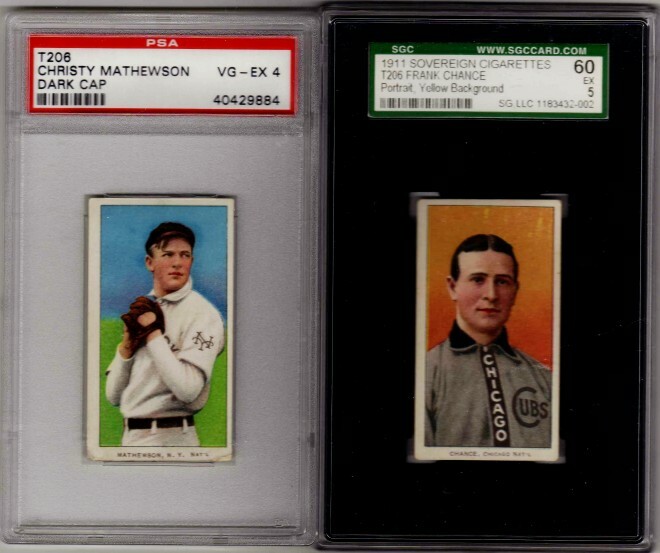 I had a small number of T206's before really being interested in them. All low grade commons. I don't really count them as the start. 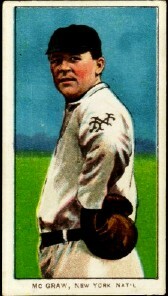 My start and what I still call my first T206 set purchase in 2010 was a Hooks Wiltse Pitching. I remember scanning the pages of ebay looking for something special to officially start my set. Viewing the scans of the fronts & backs and looking for hidden gems. Then I found it. 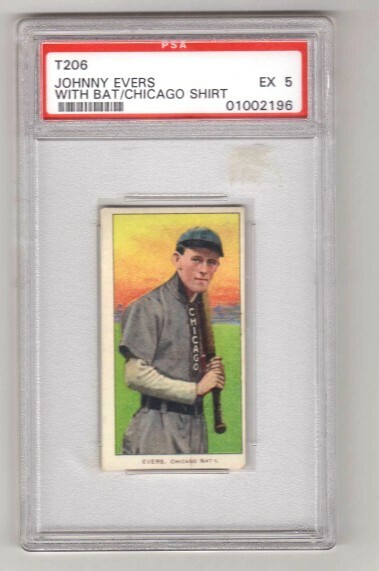 Wiltse Pitching PSA 2 with a blurry scan of the Piedmont 350-460 back. 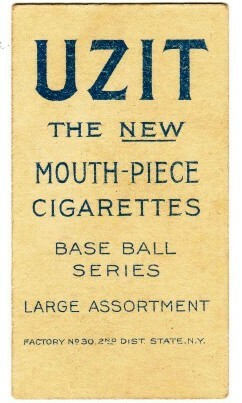 Even with the blurry scan, I could tell the factory line was longer (factory 42) than all the other Piedmont backs. So I hit the Buy It Now for $44.95 and have been hooked ever since. My first 5 purchases over the first month consisted of four Piedmont 42's and a Bob Groom Tolstoi Back. In my second month on my ninth purchase, I bought a Bob Groom Polar Bear. Nine cards in and i'm playing with the idea of a Front/Back combo set. I'm currently at 1249 different Front/Back combo's and that number has no Piedmont's except for Factory 42's and no Sweet Caporals. Within the 1249 cards, I'm ten cards away from a 520 set. The only complete back sub-set within the 1249 is the Old Mill SL set. I'm 5 away from a Sovereign 460 set, 3 being super prints and 2 others. I'm 40 away from a Polar Bear set and have the Demmitt St Louis. 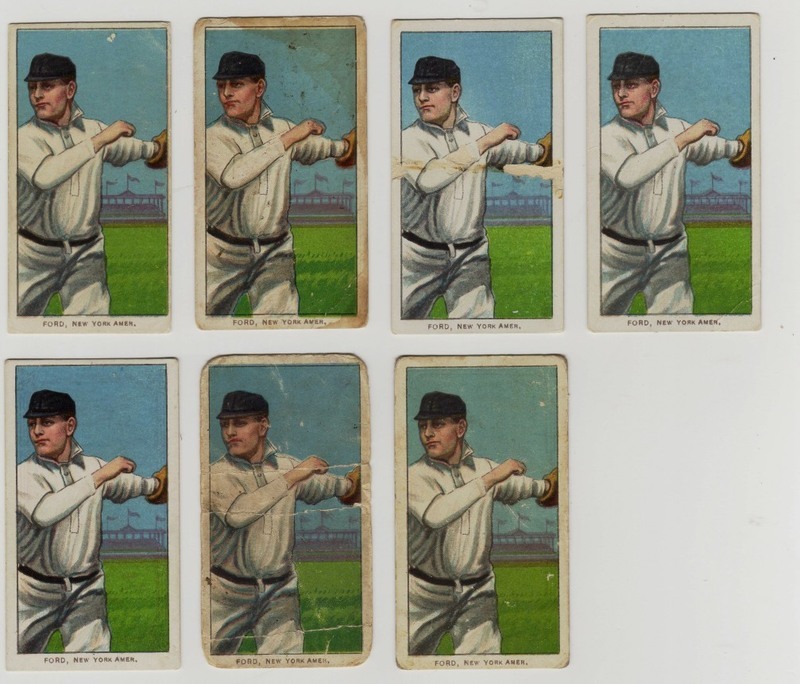 One sub-set I have that I don't count in my 1249 different cards is the Sweet Caporal 350-460 Factory 30 "No Print" Scraps, 27 different cards including Cobb Bat Off. When these were listed on ebay, only 27 different cards showed up even though I believe it is a 28 card set. I believe this is the most complete set intact. I also know David Hall has a decent amount of the set too but don't know which ones he's missing. All I can say is its been a fun 7 years since starting this set and I owe Net54 and the experts for much of it. Thank you. OK, I'll post mine. Used to collect cards when I was younger in the late 80's. My last name is Mullen. 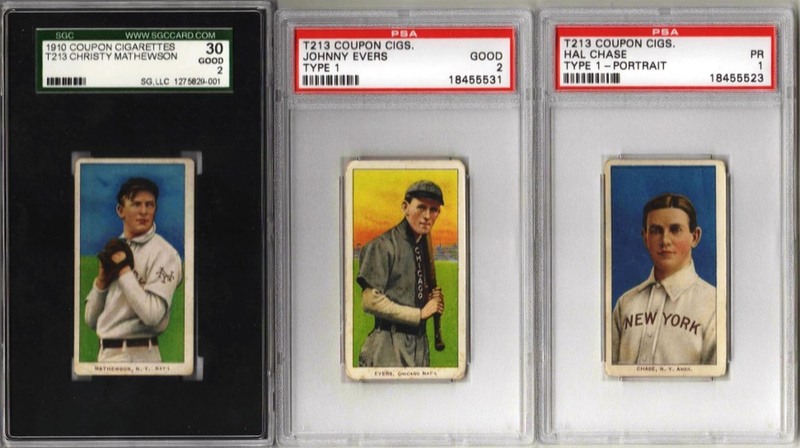 At that time I bought a T206 Mullen portrait for about $20 and a Tinker, Evers, Chance for about $25 each (the same missing red Tinker in my avatar). Fast forward to 2007 when I happened to go thru some old things and I found these 4 cards. I was just getting started with playing poker and I told myself that it would be a fun project to try and put the set together. Fast forward to today and I'm at 506. 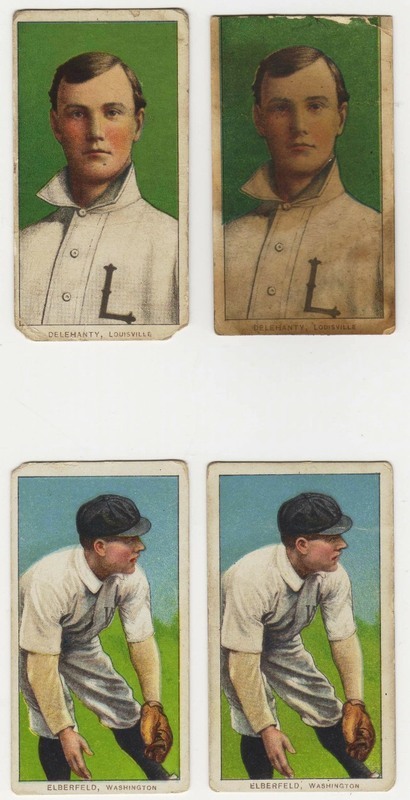 My set consists of some rare backs (Lenox), 2 signed (both Larry Doyle), a scrap (Lucky Wright), a blank back, a card with a ton of extra color that bled all over the card, and a Harry Davis Phila. Amep (instead of Phila. Amer.). My set (and my overall collection) has solely been built with poker and sports betting winnings. Although I'm up a good amount overall, it hasn't been all smooth sailing (as I've had to sell 2 green Cobb's, a signed Larry Doyle, a Lenox, and a couple others hahaha).